Will Hutchins remembers No Time for Sergeants, Will's ring. P.S. 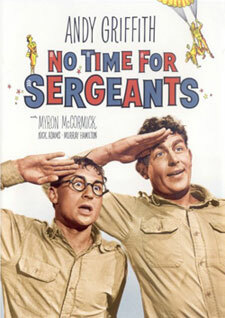 “No Time for Sergeants” was Warner Bros.’ top grosser in 1958. So, I didn’t get to play Will Stockdale, but one Marshall Hutchason got to be Will Hutchins. The pilot of “Sugarfoot” was based on the flick, “The Boy from Oklahoma” starring Will Rogers Jr. Ah, it’s a small world, but I wouldn’t want to paint it. 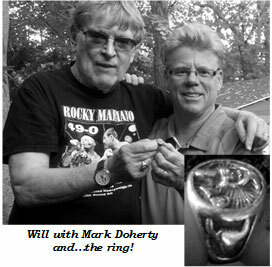 around in your yard and I found this old silver coin.” Will holds out his hand and there it is… the ring! Well, our mouths dropped open to our chests and you’d have thought that they had found Blackbeard’s treasure! What a miracle! How can we ever thank Mark and Michael for their perseverance and true belief that they could do this!? We know that Jane is smiling down on us; she may have even had a hand in directing Mark’s metal detector to the right spot. The ring is now on my hand…Will just can’t be trusted again, and his pear-throwing days are over.